Thursday 13th April 2017 – 3.20pm – Murray MacGregor. An elderly man has been airlifted to hospital with a potential fracture to his hip after he fell from a ladder. The incident happened in the Henwick Grove area of Worcester on the west side of the River Severn at about 11.40am this morning. An ambulance was initially sent but the crew requested a helicopter and the Midlands Air Ambulance from Strensham was sent, landing at the Hallow Recycling Centre. A West Midlands Ambulance Service spokesman said: “The man, who was in his mid 70s had been up a ladder when it fell leaving him hanging onto a window ledge on the first floor. “He dropped to the ground landing on his feet but falling over. “He was assessed at the scene for hip and back pain. 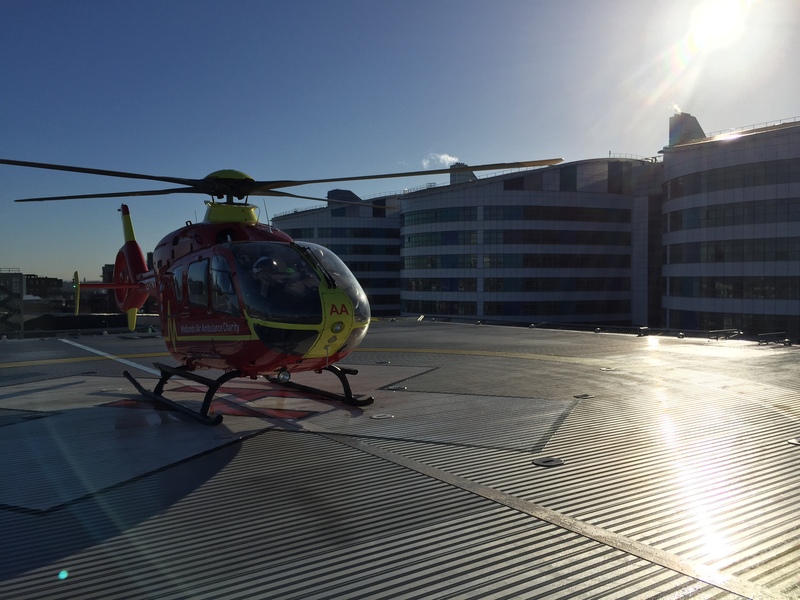 The man was immobilised, had a pelvic binder put in place and was given pain relief before being taken to the waiting aircraft for a flight to the major trauma centre at the Queen Elizabeth Hospital Birmingham. We will not be giving details of the exact location of where the man fell in order to protect the patient’s identity.